Is 'Carols by Candelight' a thing where you come from? When I was a kid, my mum used to take me along to this annual event in my home town every year. I loved it. We would pack a picnic, grab a couple of folding chairs and drive to the outdoor amphitheatre in a big park and enjoy the on-stage entertainment. This was back in the days when we actually lit real candles! We held them in hot chip cartons to protect the flame from the wind and stop the hot wax from dripping down the candlestick and burning our hands. On Tuesday, I took Eddie along to our first Carols by Candelight in Melbourne. I figured it was a special occasion, so it was OK to keep him up past his bed-time. We walked to the park with his stroller and a picnic, and waited for our neighbour and her friend to come and meet us. Eddie was so excited by the massive crowd filling up the park he would not stay still for 1 minute. He was running through fences, past barriers into the back stage area, darting across other family's picnics and rolling all over the designated walkway.I had a hard time keeping up with him and avoiding the security guards who kept telling him off for running backstage! He did calm down a little bit when our neighbor arrived because he adores her, so we had a chance to enjoy a picnic and a drink. The on-stage entertainment was not as captivating for a 2 year old as I would have liked... he still kept running all over the place. Once Santa and the elves arrived and Jingle Bells was being sung, he loved being held and dancing around with me while watching the stage. By 9pm, it had only just started to get dark. It was already 2 hours past Eddie's bed-time so I decided to start the 30 minute walk home and hoped that we would get to our driveway in time to see the 9:30pm fireworks. Nailed it. Eddie was still wide awake and talking about Santa Claus coming down the chimney, so I scooped him out of the stroller to catch his first glimpse of the colourful fireworks lighting up the sky. He was amazed! It was just gorgeous to see his face seeing this for the very first time. We'll go again next year, and hopefully get to enjoy the full experience with candles after 9pm! This was just a local area family event in Bayside Melbourne, and on Christmas Eve there is a major Carols by Candelight held in the city - which starts at 9pm (so it is actually dark enough for candles!). Have you been along to one of these events? Did you take a toddler?! Don't limit your Christmas decorating to the indoors, why not look around the outside of your home and add a little shimmer to other areas too? There is no better way to welcome guests this festive season, than having them enjoy the extra sparkle you've created for their journey to your front door. For us, it is our beautiful lemon tree that is the focal piece on the path to our front door - and it needed some bling! You don't need to spend a fortune on decorations, in fact I think it is a fantastic way to make use of those Christmas decorations that you've almost thrown out, but they haven't quite made it to the bin yet. You know the ones I mean....the decorations that are a colour you no longer want in your house, or the ones you thought you "might need one day" so they've been pushed to the back of a cupboard somewhere. Well here is the perfect use for THOSE decorations! Recycle them. Is there a tree or plant that those ornaments would look amazing on? Maybe you have a fence that looks pretty boring, and needs some Christmas cheer. One of my favourite ways to decorate outdoors is to ties some ribbons to branches or a fence and let them hang long and wave about in the breeze. For our lemon tree, we used a box of silver and purple ornaments, and simply hung them around the branches and leaves of the tree. Eddie had a bit of trouble getting the string loops over some of the leaves, but he tried very hard. Our lemon tree never looked so fancy! Next week we will do a little bit of decorating in our back garden too, but this was a nice start. 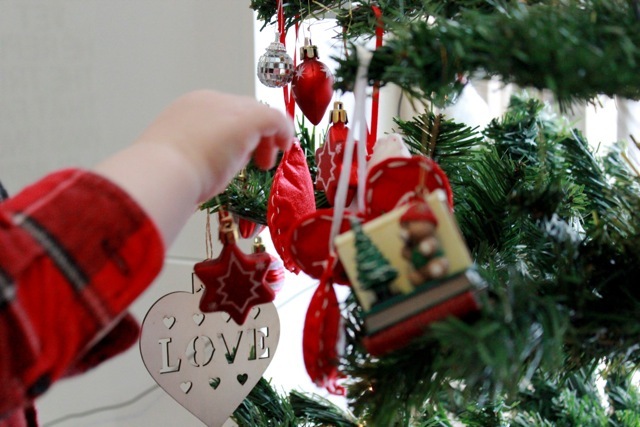 It's such a simple and fun activity to do with your kids this Christmas. Here's your task for the week - find something outside your home that needs a bit of Christmas cheer, and get decorating! I'd love you to share a photo (or a link to your blog that shows off your outdoor decorations) in the comments below. The City of Melbourne is amazing for families at Christmas time. Each year there are more activities and new places to enjoy for kids of all ages. We've been watching the preparations for the City Square Christmas Festival over the past couple of weeks, and it was finally opened to the public last night. Sadly, we were unable to attend the opening but I grabbed the family and took us all into the city this morning for a good look around. After the much-needed coffee break, we wandered over to City Square - but we were too early! It didn't open until 10am, so we could only catch a glimpse of the Christmas action inside. I love this idea for Santa letters only! It didn't really matter that we were too early to get into the City Square area, there's still plenty of other fun things to do with kids in Melbourne. We wandered down to Federation Square to look at the massive Lego Christmas Tree that was unveiled last night. It turns out that this tree is the largest in the southern hemisphere, with more than 200,000 Lego bricks making up the display. We were suitably impressed. It would be great to also see it lit up at night with all the LED lights built into it, but maybe we can do that another day. The back of the sleigh says "Sydney or bust"
We then went for a little walk along the river and had a play at Birrarung Marr playground. There was a Gin festival being set up at a riverside bar called Juniperlooza. Sigh. Chop needed to get home to get ready for work, so there was no way we could have gone to explore the different gins on offer! And it was morning... But that wouldn't have stopped us! 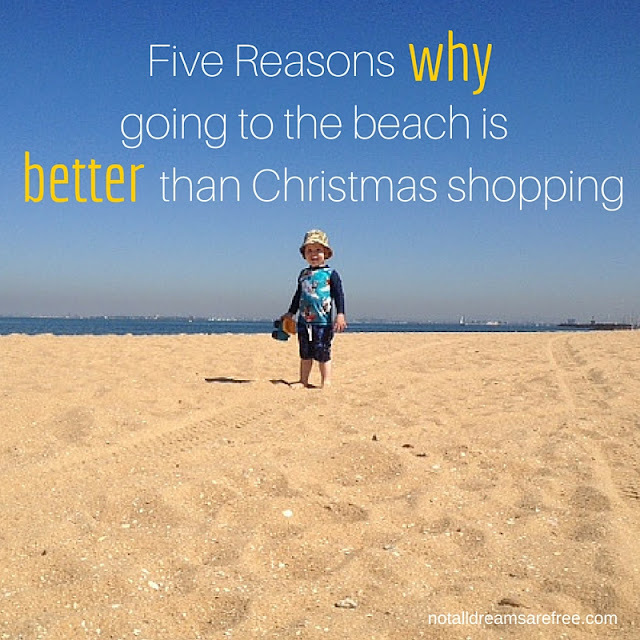 This is just the tip of the iceberg with activities to do with kids in Melbourne this Christmas. I'll be exploring more in upcoming blog posts. Friday's with Eddie - week 3. Friday couldn't come quick enough this week. It was the day I planned to take the little dude to see Santa. Yes, it's only November, but who cares? Last week's visit to the store to check out the Myer Christmas Windows was just enough to whet the appetite for all things Christmas. So when I announced that we were going to visit Father Christmas today, Eddie was so excited. He started running around the house shouting "ho ho ho"! The whole journey into the city was filled with anticipation for Eddie, who kept repeating that we were going to see Father Christmas. The train ride was fun, as we played a game where we spotted trucks, cement trucks, diggers, car parks, bridges and tunnels. None of this excitement made Eddie forget the reason for our journey - the kids was focussed! December 2014 at 17 months old. I'm so glad we went early this year. Toddlers don't do queues! We only had to wait a few minutes, and during that time we had friendly elves chatting to Eddie as he watched the elf-train going around the outside of Santa house. Before we knew it, another elf appeared and told Eddie that Santa was ready to see him. We followed the elf along a path and then she asked Eddie to knock on the door. It was the fourth door, which means that they have a very well-thought out set-up this year... multiple rooms for multiple photo opportunities - and with no chance of any of the kids seeing inside a different room. Eddie gently tapped, and then another elf opened the door. Inside Santa was sitting on a big chair, and there was a toy Rudolf curled up by the fireplace - it was even breathing. The elves and Santa told Eddie that he could pat Rudolf, which really helped him relax before going up to talk to Santa. While he was patting the reindeer, Santa asked Eddie what he wanted for Christmas. Eddie replied, "scooter". Santa then asked "what colour?" and Eddie replied "green one". Santa went on to ask if he wanted a basketball, and Eddie looked at him like he was insane and said "no". Eddie was still holding onto my leg a bit, and it really didn't look like he was going to be totally comfortable to sit with him for the photo, so Santa suggested that Eddie sit on my lap just this time, and next year he might be able to do it himself. So that's how I got roped into being in the photo again this year. At least there were no tears at all - in fact Eddie looked happy! 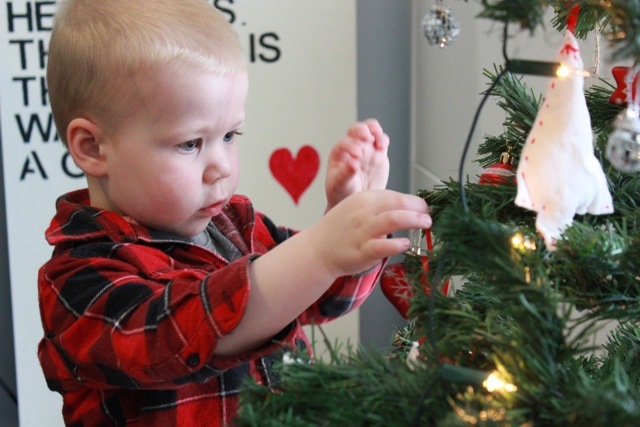 November 2015 - Hello Santa! After visiting Santa, Eddie jumped on the little train that surrounds Santa's house. This was the first ride he has been on without me, and he loved it! Most of the kids on the little train looked like they were 2 or 3 years old - they all seemed a bit stunned and excited to be putting around on the ride. All the elves were waving at them as the train did its laps, and the kids were all just staring back. Very cute. Well done to all the elves for being so good with the kids at Santa's house. They must get soooooo busy as Christmas gets closer! I highly recommend getting in early for your Santa visit this year, so the whole experience is a fun one. When are you visiting Santa this year? I'd love to hear about your visit - please leave a comment and keep me updated on your visit! Have you been delaying moving your toddler into a proper bed? Have you held back because you're worried about your little one escaping at all hours of the night? Or falling out of bed? These are genuine concerns, and I know exactly where you are coming from because we held off as long as possible to put Eddie in a "big boy bed". 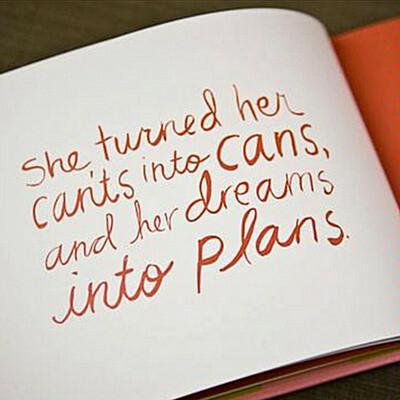 But we are so glad we did, and after 9 weeks I can confirm that the transition has been a very successful one. I want to share a few things I've learned about making this transition positive and gentle. How do you know if they are ready? There is no magic number for what age you should move your child to a bed, it is all about waiting for the signs that they are ready. Are they starting to show an adventurous side? For a few months, Eddie was easily climbing into his cot from the floor, but had not yet worked out how to escape. We thought the first time he escaped his cot might have been a fluke, but we still ordered his bed online anyway. It was another 4 weeks before he climbed out again, and on this day he was getting so clever at getting out of his sleeping bag and out of the cot within 30 seconds of our repeated attempts to put him back down for a nap. That prompted us to make the transition. So, don't force it too soon, and don't be in denial about it when your child does get the strength to climb out. Moving him or her into a bed is the best thing for their safety. We had been to a few bed stores many months ago, before there was any climbing at all - just to get a feel for what type of kids furniture was out there. It all seemed really nice, and also very fancy. We came to the conclusion that our son, who had just turned two, needed something that would make the transition fun and positive for him. He didn't need a king single bed, or a bed with a trundle mattress or drawers underneath. He just needed a toddler bed to start with. 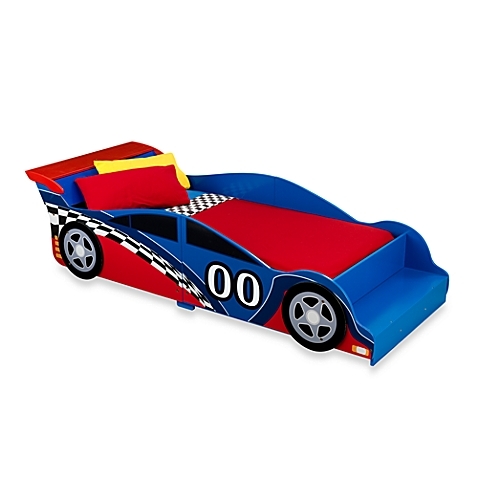 But not just any toddler bed, we bought him a RACING CAR BED. Eddie even helped me build it! He woke up early and opened his bedroom door (which woke us up at 5:00am) and then marched into our bedroom and announced his arrival with a big giggle and a happy stomp of his feet. I dragged myself out of bed and carried him back to his bed and told him it's still sleepy time, and should sleep more - we will come and get him after the sun comes up. He started to sook, and I gave him a kiss and said I love you but it's still night time and we sleep when it's dark. Then I walked out, closing the door behind me. A few minutes later he did the same thing again - announcing his arrival in our bedroom. I took him straight back to bed and he stayed there sooking until I went and got him. Not real tears, just whinging. When I went in to get him at 6:00am, he was still sitting on his bed exactly where I left him. He looked pretty sad about being left there, but he did exactly what we asked him to and waited until it was time to get up. You might expect the lunchtime nap to be the biggest challenge, as the room has more light in it and the temptation to play could be greater. We expected the same thing. The key for us to get through that first day-time sleep was to get Eddie so completely worn out from morning activities, that he will be so exhausted after lunch and be happy to sleep. It worked! He went to bed with no trouble at all. So my best advice is to go to the beach or the playground or swimming classes - do whatever it takes to keep your toddler super active to prepare for that first day nap. 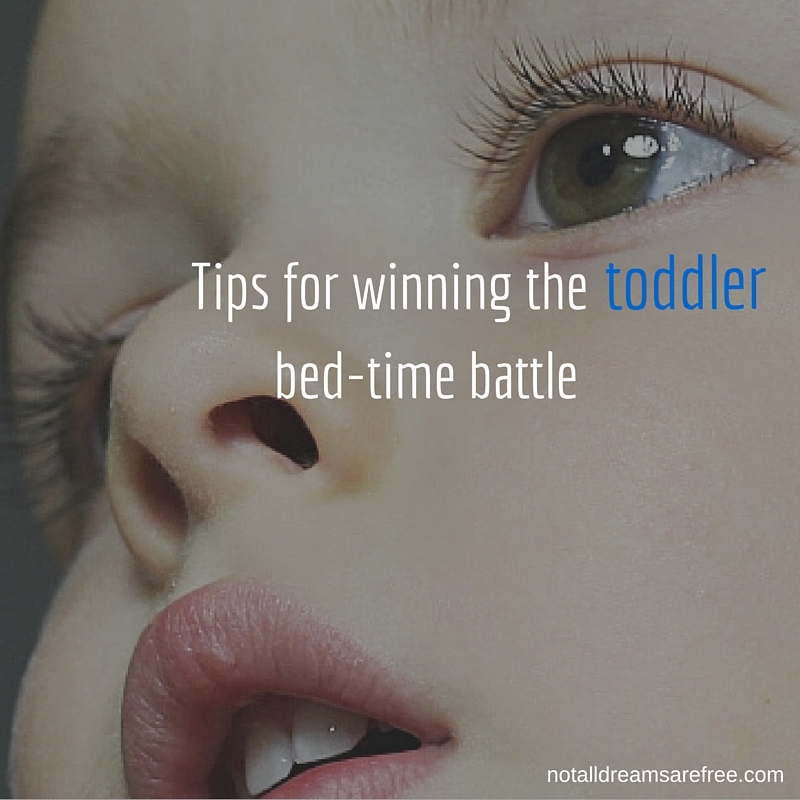 During those first few days of making the transition from a cot to a toddler bed, you might experience some battles. I'm sure that's normal as your toddler is testing out the boundaries and wants to see how far they can push the limits. We have always been really strong with our bed-time routine, so Eddie knows what to expect and we can hopefully avoid those battles we hear other parents talking about. So, while we had no issues at all with the 'going to sleep' part, we had to really assert ourselves in the mornings of those first few days. We stuck to our decision to keep returning him to his bed whenever he came into our room. It only took 3 days, and then he actually started to sleep in until 6:30am or 7:00am. The novelty had worn off because he had no success. Every morning he simply starts talking when he wakes up, to let us know he's awake, and he stays in bed and waits for one of us to come in and collect him. He seems to love the morning routine like this, it's very exciting to see which parent is coming through the door, and then he jumps up and starts excitedly talking. It's now been 9 weeks since he moved into the toddler bed, and it's only now that we are starting to see another phase of testing the boundaries beginning. Every night this week we have read him 3 stories, then told him it's time for sleep. He happily lies down and we kiss him goodnight then leave the room. I go and jump in the shower and during that time he has gotten up, shuffled across the room in his sleeping bag, turned on the overhead light, collected a few toy cars or books, shuffled back to bed and that's where he lays playing with his cars or reading a story until he falls asleep. The first couple of nights we kept going in there and putting the toys/books away and turning the light out, only to discover he's turned it back on within a few minutes. On the 3rd night, we've decided to just let him play quietly, and we will turn the light out as we head to bed (and for us, that's really early because Chop often needs to get up at 4:30am to get ready for work). The key thing here is that we thought we were reinforcing his behaviour by continually popping in to the room and turning the light out. It was like an exciting reward for him to get another visit from Mummy or Daddy. So we decided that since he was just playing quietly or reading quietly, then putting himself to sleep in his bed, then that doesn't warrant a disruption from us. We will just tuck him in and turn the light out later... So far so good! If you are getting yourself mentally prepared for moving your toddler out of a cot and into a bed, then hopefully these tips can help you feel less stressed about it. And if you are someone who has been battling with your toddler about bed-time, please tell me if you've tried these tips and how they turned out for you. What has worked or not worked?